Do you like bold, bright colors infused with simple design? The answer better be ‘Yes’ since the iconic Marimekko design embodies these design principles. This design is so popular that it started a new trend in clothing, home design, fabric and everywhere. In fact, ‘Mekko’ means ‘dress’, So you now have a chart with a fashion sense. Segmentation and Pattern analysis are a big part of business analysis and with traditional charts you need to piece multiple individual items together in your mental map to draw conclusions. 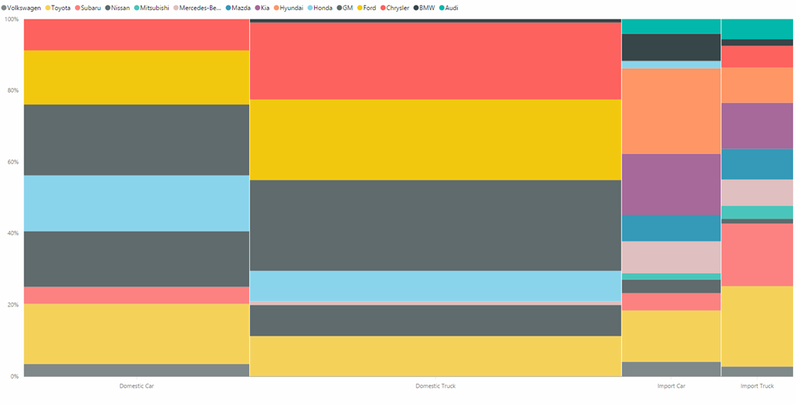 For dealing with such complex business analysis involving multiple variables/dimensions, the iconic marimekko design is very appealing and the Mekko chart makes it super easy to achieve this in Power BI. In simple terms and without all the above hype :), a Mekko chart is a combination of a 100% stacked column chart and a 100% stacked bar chart combined into one. Similar to a treemap, the dimensional values are represented by the length and width of each rectangle. The width of a column is proportional to the total value of the column. Since it captures two dimensions in one chart, you can quickly spot the large segments as well the ones that are underrepresented in one quick glance. You can either use the same measure for the column height and width or use different ones depending on your need. The Mekko chart visual also allows you to control the legends, data colors, and data labels for a truly customized presentation. To use, simply download the Mekko diagram from the Visuals gallery and import it to your Power BI report and use it. You can also download the pbix file with sample data.